So my son Harley wanted a special cake for school to mark the last day of the year. He decided that he wanted a yellow submarine that was being attacked by a monster octopus. 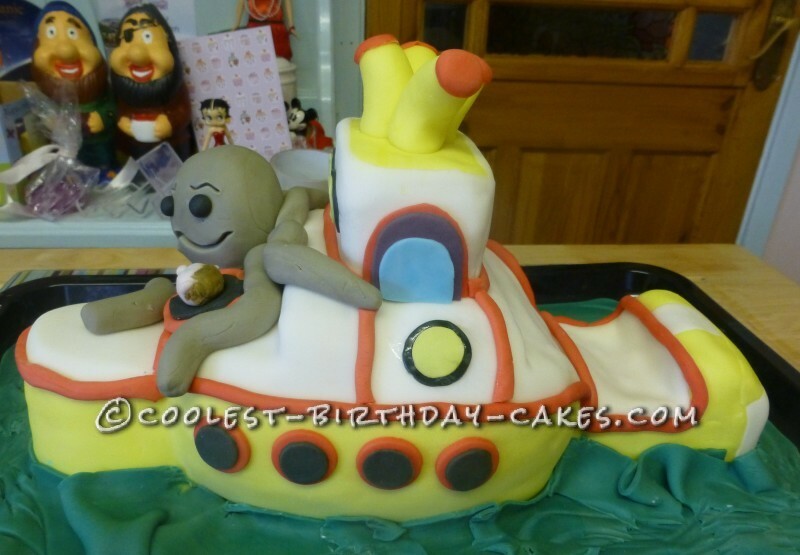 So naturally I went on line and found a picture of the famous Beatles yellow submarine and used this as the basis for my cake design. I started by baking two bowl shaped cakes and one square cake, using a simple sponge recipie. It does need to be a firm sponge recipie so that you can carve the shape that you need without it ending up as a pile of crumbs. 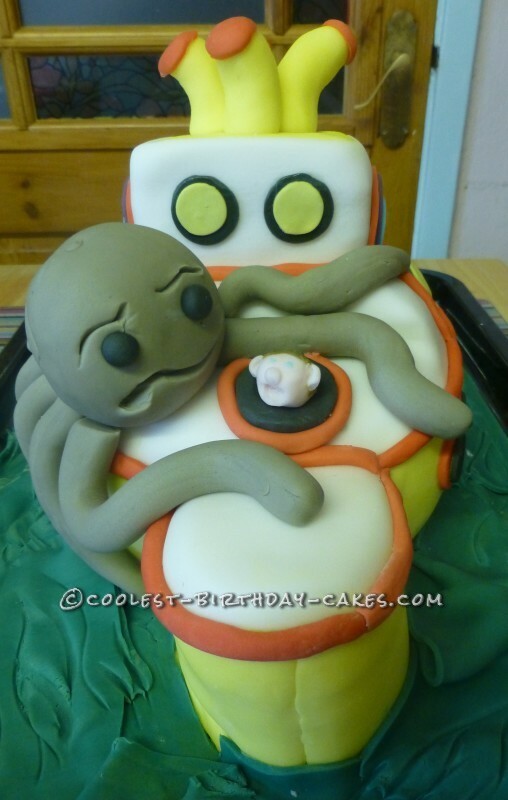 The two bowl shaped cakes were for the middle section of the submarine. I then cut the square cake to make the front and back ends and the top turret shape. I sandwhiched all these pieces together with buttercream and then used the pictures as a guide to carve it all into the shape of the submarine. It’s the first time that I had tried to do a cake that needed so much carving so it did take quite a while, but by printing off a few pictures that showed the different angles of the yellow submarine I was able to get the shape I wanted. The trick is to not take off alot at one cut, and to keep all of your off cuts until you are finished. The off cuts come in very handy if you do cut off a bit too much as you can just buttercream them and add them onto your shape. 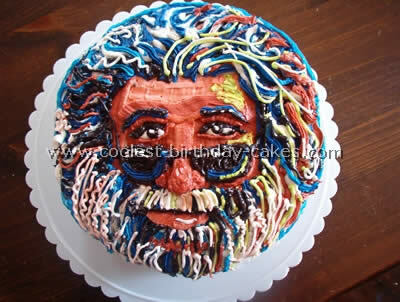 When I was happy with the shape I covered it all in buttercream. I found that it as too difficult to do this with a knife so I piped it on instead and then smoothed it with a knife. I let the buttercream set for an hour and then I then covered the entire cake in whte fondant. I did this a section at a time. I then added in the sections of yellow fondant and then all the portals, red trim etc. 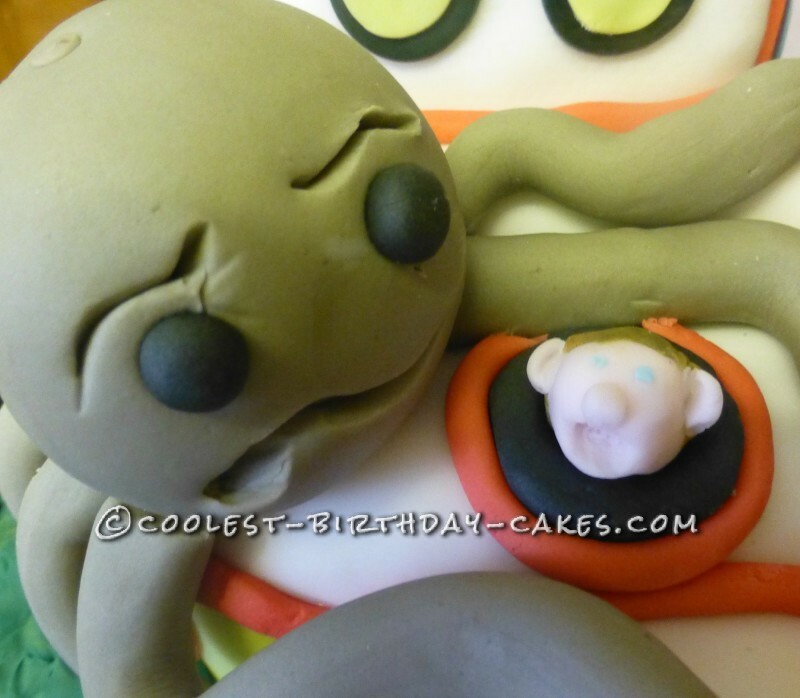 The top funnels and the face and octopus were made out of modelling fondant so it woud hold the shape. I used blue/green marbled fondant for the sea around the submarine. Harley was very pleased with the end result and off it went to school. When he came home I asked him if they all liked the famous yellow submarine and would you believe that no one including Harley knew that I had tried to make it look like the Beatles yellow submarine. Harley said that he had just asked for a yellow submarine because it was a favourite colour. What are the youth of today coming to? The cake was a great success at school though and they couldn’t believe that it I had managed to carve the cake and keep it all in one piece.